Google pulls the keywords for your app from the app description. Basically, you want your description to convince your users to download your app and convince Google to rank your app high for all of your keywords. Follow this recipe and learn how to craft your description copy into a masterpiece. Your first three sentences are the most important ones. Make sure to explain to your users your app’s main value proposition and if possible, share your success. Mention the fact that you were featured, won awards, gained PR, or even put in a stellar quote from a user. Make sure that the description has natural sounding phrases or sentences. Use your tier one keywords in the first few lines. 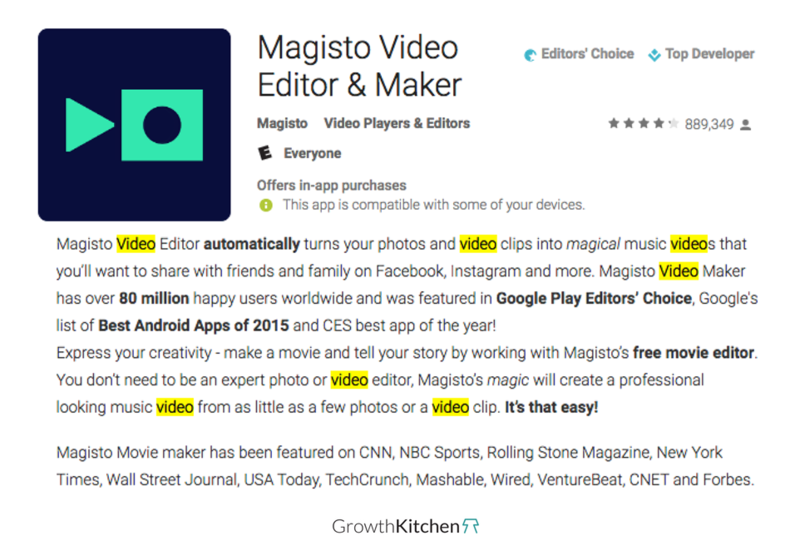 Avoid stuffing these keywords into your app description. Use short sentences and leave spaces between the lines to make it easy to read. After explaining the app’s main value proposition, add a list of your app’s main features. Put the features title in capital letters to make it easier to skim. Start with seasonal promotions, and sort your features by their relevance and popularity among users. After your feature list, add a summary with links to your social media channels and your contact details. You might want to add some disclaimers, but avoid giving users a reason to not download it. End it with a call to action- invite your user to contact you with any feedback and questions. In your long description, you can use 4,000 keywords. You want to take advantage of this space and explain to your users everything about your app while also using many keywords. Keep in mind that a huge blob of text can be a turnoff to potential new users. Use your tier one keywords five times, your tier two keywords three times, and your tier three keywords one or two times. Be sure not to use any one keyword more than five times, because it has not been shown to help, and it could even be considered keyword spamming. After revising your app description, use the A/B testing experiments tool in Google Play to A/B test your new version versus the current one. Once you implement the winning one, keep measuring the effect that the change had on your downloads. Since the description directly affects your keywords, also monitor your keyword rankings.